This article is about a minigame in Mario Party 7. 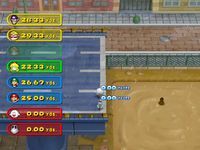 For the Mario Party 2 minigame of a similar name, see Give Me a Brake!. 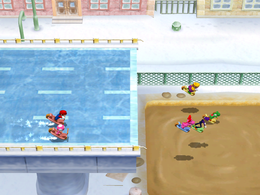 Gimme a Brake is an 8-player minigame in Mario Party 7. Its name is a pun on the phrase "give me a break" and mechanical brakes. Perfect scores go to Boo and Dry Bones. The eight characters, on scooters, start out on the top of a hill. At the end of the road is a mud pit. The players have to stop their scooters as close as they can to the mud pit without falling into it. The team that stops closest wins. There are different weather conditions that affect the player's ability to stop on a dime. Sometimes there is rain and the player must stop a little earlier than they would with dry, sunny weather conditions. There is also snow which causes players to have to stop a lot earlier than with either rain or sun. Rules – "Stop your scooter closest to the course's edge by hitting the brakes at just the right moment." Advice – "The scooter slows at different rates based on the weather. Time it carefully...and don't fall in the mud!" This page was last edited on December 20, 2017, at 11:24.